When we went for an early morning stroll in Girona, Catalonia, my husband, Gary, and I saw a group of well-dressed people standing impatiently outside a shop. We took a closer look and saw a storefront with impressive, fluted grey stone columns, large display windows, and imposing glass double doors. The merchandise on display was unusual: small metallic capsules in coordinated colors arranged in geometric designs. Emblazoned in glowing white letters over the doors was “Nespresso.” Nespresso? The coffee capsule brand? The crowd grew increasingly noisy and impatient. We decided it was time to leave before they became even more restive. I was puzzled. Who would want to purchase pre-made coffee capsules? It seemed neither cost-efficient nor ecologically sound. And besides, when you ran out, there was nothing you could do—except wait desperately for the Nespresso shop to open. Returning from our stroll, we paused again at the shop. Nespresso was its name and luxury was its selling point. From our vantage point we could see inside. Slim young women in classy matte-black uniforms stood near the open door, gatekeepers into this exclusive club. People entered, sometimes showed a membership card, chatted for a moment discreetly, and then were ushered into this high temple of gustatory excess. We started to enter but then thought better of it. Clearly this was not a place for browsing. Besides, we weren’t sure we would be admitted. We weren’t members of the club. Several weeks later we were walking with a friend of ours, an elegant and sophisticated resident of Girona. When we passed the Nespresso store, she stopped abruptly. “I need to buy more Nespresso capsules,” she explained. She rummaged in her purse, then found her card. “We’ve never been inside,” I admitted. We tagged behind her as she waved her tasteful matte-black and metallic card at the eager-to-assist assistant. A brief exchange in rapid-fire Spanish ensued. First purchase, then free coffee, she explained. I looked around. Matte-black walls were set off against a creamy background, resembling the crema on top of fresh espresso. 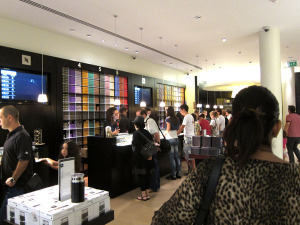 One matte-black wall included a built-in storage unit, filled with multi-colored arrangements of coffee-capsule boxes. On other walls, backlit China-red lacquered niches showcased glass Nespresso glasses and coffee capsules, presented as objets d’art. A nearby wall was a feast for the eyes, the 16 different “Grand Cru” coffees displayed like bonbons, each variety hermetically sealed in its own color-coded metallic capsule. Attentive clerks waited behind matte-black counters to assist customers. I suppose I should call them “members,” not “customers,” since “customers” sounds so commercial. The clerks (or should I call them “personal shoppers”?) eagerly helped club members decide amongst the numerous options of coffee and accoutrements: elegant, color-coded cartons of coffee capsules; gleaming chrome and black Nespresso machines of various sizes and complexities; dark wood cases and Plexiglass stands for Nespresso capsules; metal espresso cups that were a playful riff on Nespresso capsules; and specialty sugars and cookies. Each type of product was tastefully displayed in its own area. After our friend completed her purchases, which were carefully placed in the distinctive matte black, silver, and gold Nespresso bag, “our” assistant led us to the back of the shop to the coffee bar. She invited us to sample the newest AAA Sustainable Nespresso café. A video played silently on a large TV screen, showing the process of growing and harvesting the AAA Sustainable Nespresso coffee we were about to imbibe. We sat on padded stools whose upholstery colors coordinated with the colors of the coffee capsules. The circular table in front of us displayed open bins of coffee beans, presumably so you could sniff the different varieties. The assistant deftly popped capsules into the Nespresso machines, and within moments we were presented with small white cups of steaming, crema-topped café. She explained briefly the particular characteristics of this exclusive coffee (a Limited Edition, only available for a short time): caramel overtones, creamy, #8 on the intensity scale. I realized this was the first I’d heard any mention of aroma and taste—presumably the reasons you buy coffee. Across the table from us, two elegant Spanish ladies engaged in intense conversation about their latest Purificación García handbag purchases. Next to them was an electrodoméstico (household electronics) repairman. Although membership in the Nespresso club seemed exclusive, it actually wasn’t. Anyone, including ourselves, could join if we were willing to pay the price. The coffee tasted good. But was this a club we wanted to join? We expressed our doubts to our friend. Wasn’t this just an über-successful marketing ploy? What a concept: an espresso machine that is easy to use, requires no clean up, and produces uniformly good coffee. And you get a choice of flavors—16 choices in fact, plus special editions. In addition to the convenience, you get to make your purchases in a jewel-box-like store—I mean boutique—that reeks of exclusivity, of luxury that is surprisingly affordable. In this time of financial crisis, it’s a brilliant concept. Nonetheless—or perhaps because of the success of the marketing concept—I had a few qualms. The coffee packaging, for example, hardly seemed ecological. And the concept definitely felt elitist. I picked up a few tastefully designed brochures and started reading. One encouraged capsule recycling and explained in detail the advantages of the aluminum capsules; another described the AAA Sustainability program; another emphasized the energy-efficiency of the various espresso (oops, Nespresso) machines. Fitted into one matte-black wall was a recycling center, a discreet reminder to remember the environment. Almost against my will—and probably against my better judgment—I was convinced—or rather converted—to the Nespresso concept. Hesitantly, I reminded Gary I had a birthday coming up. Not surprisingly, there was a special offer. Soon we, too, were Nespresso Club members and the proud possessors of a shiny new Nespresso machine. 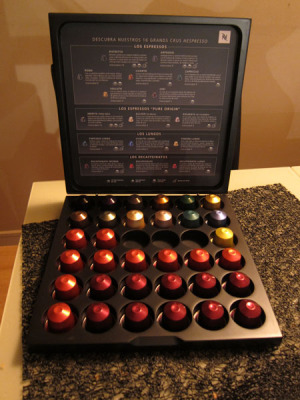 It came with a sample of the 16 different coffees and a booklet describing in detail the varied aromas and flavors so that we, too, could learn to be coffee (make that Nespresso) connoisseurs. Although I say we were the proud possessors of the machine, I am not sure who actually was possessing whom. That evening I went online and discovered that Nespresso has opened a “Star Boutique” in Paris, a “two-story edifice only a few steps from the Arc de Triomphe” on the Champs Élysées. Paris. The Champs Élysées. Suddenly I realized that I had stumbled on a new kind of travel: Nespresso tourism. We could travel around Europe visiting Nespresso boutiques. After all, we were card-carrying members! We could enter these temples of luxury, make a purchase, and sit with others “like us” to drink the coffee of the day. We might even run into George Clooney. The future spread out before me. We would usher in a new kind of pilgrimage. Instead of traveling to sacred places, we would travel to shrines to conspicuous consumption.